An early-season blizzard cruelly interfered with the Delmoni-McCarty-Thomas String Trio’s concert Sunday, November 20. However, the 75 stalwart Adirondackers who braved the weather were richly rewarded by an exquisite program of mature Mozart (Divertimento in E-flat Major, K563), early Beethoven (Trio in C minor, Op. 9, No. 3), and youthful Dohnanyi (Serenade in C Major, Op. 10). 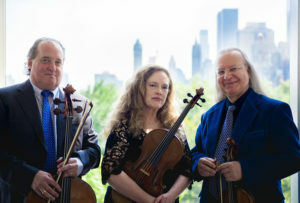 Arturo Delmoni on violin, Patricia McCarty on viola, and Ronald Thomas on cello played with deep camaraderie – theirs is a longstanding friendship – as well as deep comprehension of and affection for the music. What an outpouring, what a love-feast, what sublime beauty! This is a trio that should be touring everywhere and heard by everyone, but alas! Individually they’ve been there, done that – making the rare occasions when they play together all the more to be cherished.